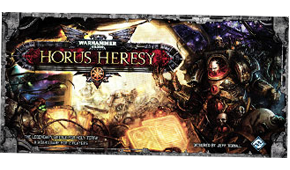 The most legendary battle in the history of the Warhammer 40,000 universe unfolds across the razed plains of Terra and in the frozen orbit above. The big ‘coffin-box’ remake of the Games Workshop classic wargame. A beautiful thing, especially with revised rules and 3D plastic board sections and figures, but I do wish they’d made the Palace areas of the board larger so you could fit figures on them more comfortably.